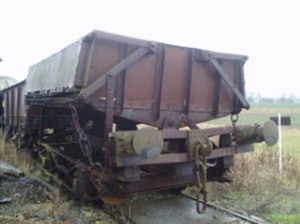 Also known as side-tipping wagons, these 15-ton buckeye coupling fitted wagons were inspired by American practice and were pioneered in Britain and the ironstone ore fields by the Oxfordshire Ironstone Company. They were built from 1920 by Gloucester C&W Co., Metro-Cammell and Birmingham Railway Carriage & Wagon to work from quarry face to the crushing plant at Wroxton. They were later used at other quarries particularly Corby for moving overburden and sand excavated during quarrying.